2014 – starting with a great doTERRA offer! The folks who call the shots at doTERRA are off to a great start in my opinion for 2014. Their FREE Frankincense promotion is being extended through January 15! If you want to place a retail order, my store URL is http://MyDoterra.com/SanteeOils … and if you want to enroll as an IPC ($35 wholesale account, gives you approx. 25% off your orders for a full year) then just fill out the contact form below and I’ll get you set up (and I might be able to get you an extra $100 worth of product, on top of the Frankincense offer with the New Year, New You promotion). And the freebies don’t stop there – make this a 125 PV Loyalty Rewards Order to process before the 15th and January’s free Product Of The Month, Wild Orange essential oil, will be included too! I am very excited over the feedback I’ve been getting from people using the doTERRA OnGuard Whitening Toothpaste. The first huge advantage is that it is fluoride free. Fluoride ingestion is a scary thing, especially in our little ones under age 6. In 1997 the toothpaste companies were required to start including a warning label and phone number to call in case of ingestion on their tubes. Have you ever called that number? Back in October I heard a story of someone who did (out of curiosity) and they were immediately connected to poison control (I mean *immediate* … there wasn’t even time for a pleasant “please hold while I connect you …”). PC told him to get his son to the hospital asap, at which point he had to ‘fess up and admit his son didn’t really ingest the product, he was only curious. Still not sure about the health risks involved with fluoride? Check out this post from the Flouride Action Network at FlourideAlert.org: Toothpastes. Interesting tidbits. I hadn’t realized how trusting and ignorant I have been! So let’s talk less scary stuff. OnGuard Toothpaste. I am an Independent Product Consultant for doTERRA and I continue to be amazed by these wonderful products. I’ve had some good feedback from my friends and clients and hope you enjoy reading these testimonials as much as I do! A friend of mine was experiencing extreme sensitivity in her mouth (I can’t remember if it was gum or tooth pain off the top of my head). In less than a week after using the OnGuard Toothpaste from doTERRA, her sensitivity was gone. I was intrigued! Yesterday I heard from another friend. She, her mom and I drove to the annual Convention together in Salt Lake City. After hearing the story about regular toothpaste and the poison control number listed on the tube, her mom (Candy) and I immediately purchased our own OnGuard Toothpastes and threw out our traditional pastes when we arrived home. That was 6 weeks ago. Yesterday morning Candy went to her scheduled appointment for her oral surgery and asked her doctor to double check her numbers. He did and found that she was no longer in need of the surgery. Wonderful news! Candy was also adding a drop of Melaleuca and Clove at her brushings for an extra boost (although there is already Clove in the OnGuard blend). If you had a chance to attend my On Guard webinar earlier this week, you heard how good the oil is at addressing oral abscesses and gum issues. These testimonials are wonderful to hear! OnGuard Toothpaste retails for $11.33. If you have a wholesale membership (only $35 for a full year) then the price drops to $8.50. A 4 oz tube will last quite a while, depending on how many people are using it. You only need a pea-sized amount at each brushing to be effective! To purchase retail, just visit my store at http://MyDoterra.com/SanteeOils. If you would like to take advantage of the wholesale membership (no ordering requirements, it is comparable to how a Costco membership works), then just click JOIN in the upper right corner of that landing page. You’ll be given two choices – click the top button for the $35 membership which will give you an average of 25% off all purchases for the year. Have you been using the OnGuard Toothpaste? I’d love to hear your testimonials in the comments section! “Dr. Hill’s experience with patients and his research has concluded that most gastrointestinal disorders are secondary to inflammation from bacteria, viruses, parasites and other microbes and a lack of good nutrition.” DigestZen has been found to be antibacterial, anti-inflammatory, anti-micorbial, anti-nausea, anti-parasitic, anti-spasmodic, soothing for hangover symptoms (alcohol, sugar, carbohydrate or meat protein). It soothes and subdues acid reflux, stimulates repair of damaged tissues of the digestive system, been credited with reducing polyps in the intestinal tract. Use DigestZen on the wrists for indigestion relief. 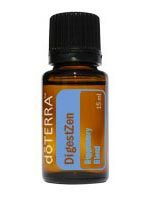 Use DigestZen around the core of the stomach and on the wrists for nausea, severe indigestion, vomiting, diarrhea, cramping, food poisoning, acid reflux, esophageal burning, gas, bloating, colic (for a tiny baby use on the bottom of feet). – I attended an oil presentation and met some great people. One of the shares from Sandra, the presentor, caught my attention. She was out to eat with some friends for an evening of fun and socializing. However, something from the dinner caused everyone to have upset stomachs. Sandra took her DigestZen at the first sign of tummy difficulties and made it through the night with quick relief and no further symptoms. Over the next couple of days as she checked in with her friends, she found out that everyone else had full-blown food poisoning symptoms. DigestZen to the rescue! UPDATE: I LOVE THIS OIL! The relief was practically immediate and I can’t remember the last time I was pain free from my *constant* acid reflux. I am sold! Ready to purchase? Visit my storefront and purchase item #3007 (15ml of Frankincense) for $93.00. Save on your purchases: contact me about purchasing either a 1 year membership for only $35 (to save approximately 25% off all purchases) or a lifetime membership for only $10 (to save approximately 20% off all purchases)! With your 1 year membership, you can also enjoy the business opportunities in selling the oils if you would like. Three days left, don’t miss out! During June 2013 – Save 10% on your purchase of doTERRA Elevation Blend Essential Oil. Elevation is the perfect blend for those moments when you need to be revitalized. This exciting blend provides an invigorating combination of CPTG® essential oils that can elevate your mood and increase your energy. Elevation is a blend of lavandin, tangerine, elemi, lemon myrtle, melissa, ylang ylang, osmanthus and sandalwood blended flawlessly for an immediate and dramatic effect. For aromatic or topical use. Ready to purchase? Visit my storefront and help yourself stay healthy this season (look under Oil Blends). Regular Price $49.33. Sale Price 10% off – purchase in June 2013 for only $44.39. Save even more: contact me about purchasing either a 1 year doTERRA membership for only $35 (to save approximately 25% off all purchases) or a lifetime membership for only $10 (to save approximately 20% off all purchases)! With your 1 year membership, you can enjoy the business opportunities in selling the oils as well, if you’d like. Apply over the heart, bones behind the ears, ear tissue itself, neck, thymus, temples, across the brow of the forehead, and on the wrists with an expectation of feeling good and you will. Apply on the heart reflex points. Wear as perfume around others that may need a mood lift or attitude improvement. Any of the diffusion techniques usually offer the most effective technique for depression, fatigue or anxiety. The blend can be applied by massage to the neck shoulders, back and chest of adults or children suffering from depression or stress. Use an inhaler or cup and inhale after massage applications. Use an inhaler or tissue cup to enjoy the effects on-the-go and to combat jet lag. This blend addresses: Attention deficit, Depression, Hopelessness, Lack of energy, Stress. Elevation: The Oil of Joy. This blend was formulated as an antidepressant. The warm vibrations of the oils used in this Joyful Blend can soothe the heart and balance the emotions. Elevation can assist individuals in letting go of lower energy vibrations. Old habits and addictions lose their appeal as an individual shifts into higher levels of consciousness. Zyto Scanner – what a great tool! I’ve been away from posting for far too long … I have SO MUCH to share with you! I have to share the recipe for my Citrus Bliss Cheesecake Mousse, take about the amazing success I had in April with DigestZen, the wonderful progress I’ve made in May with Melaluca and talk about my June “experiment” as I learn about using Lavender with the dogs. Coming up I will have recipes for my Cinnamon PB Energy Balls and as soon as I perfect the recipe for my Lavender, Tangerine and Spearmint Sherberts those will need to be posted. Oh, and there is a new 10% off special for June along with a wonderful set of summer-exclusive oils to share. But for today, I have to put all of those aside to tell you about a super fabulous wonderful tool that I have recently learned about and experienced for myself. Oh, and I have to share my frustration for reaching a plateau in my weight loss and ask YOU for your tips for pushing through this point. So, read on and find out just what has me so incredibly pumped up! I attended a class on sharing the doTERRA oil experience and the presenter had access to a Zyto Scanner. What is a Zyto Scanner? That was my first question as well. Go to the Zyto home page and at the top click on LEARN MORE for a brief video introduction. Way too cool, isn’t it? If you are a distributor for doTERRA Essential Oils, Natures Sunshine Vitamins, 4Life, Be Young, Forever Green Compass, Forever Living, Good Herbs, Innerlight, Nature Rich Inc., Newsun, VEO Natural, Waiora USA, Inc or Young Living Essential Oils then you NEED a Zyto Scanner! This is a wonderful way to help your clients out right now, to customize their product purchases to what state their bodies are in TODAY. To purchase your own Zyto Scanner, just click HERE. I appreciate you using my affiliate link, this is how I am going to be able to purchase one for myself to use at the Spa and for my doTERRA clients. Now, about weight loss – I’ve hit one of the horrid plateaus! What do YOU do to push past a sticking point to continue your weight loss quest? I’d love to hear, and hopefully find just the fix I need to get back on track. Suggestions, anyone! Slim & Sassy Metabolic Blend – on sale this month! During May 2013 – Save 10% on your purchase of Slim & Sassy. A drop a day really will help the pounds melt away! doTERRA’s Slim & Sassy Metabolic blend is a proprietary formula of 100% pure CPTG Certified Pure Therapeutic Grade essential oils designed to help manage appetite between meals. Just add to water and drink between your healthy meals throughout the day to help manage hunger, calm your stomach and lift your mood. I’ve been using mine by adding a drop to my toothbrush in the morning, adding my toothpaste and brushing as usual. I am convinced it is helping curb my sugar cravings – my soda consumption has gone from about 1 a day to about 1 every two weeks with almost no effort or will power! Ready to purchase? Visit my storefront and help yourself stay healthy this season. Regular Price $32.67Sale Price 10% off – purchase in May 2013 for only $21.41. Save even more: contact me about purchasing either a 1 year doTERRA membership for only $35 (to save approximately 25% off all purchases) or a lifetime membership for only $10 (to save approximately 20% off all purchases)! With your 1 year membership, you can enjoy the business opportunities in selling the oils as well. Not just good for you – but beautiful too! You know theapeutic grade Essential Oils have wonderfully natural fragrances. And that they are powerful in relieving mental, emotional and physical issues. But did you know they can be beautiful too? Introducing the Limited Edition Rhodium-plated Aroma Diffuser Necklace from doTERRA! Treat yourself or the special women in your life (this Mother’s Day, for the Graduating Woman or for any special day) to a dōTERRA oil diffusing necklace and one of our proprietary mood enhancing oil blends — choose between Balance (15 mL), Elevation (15 mL), or Serenity (15 mL). The rhodium plated necklace has a beautiful tear-drop shaped locket on a 30 inch chain. It comes with 50 interchangeable natural beads, all in a lovely purple satin gift bag. By placing a drop or two of essential oil on the beads and placing them inside the locket, the wearer can enjoy the natural diffusing aromas. This limited-time offer won’t last long so purchase yours today! BALANCE (a grounding blend) – Everyone experiences moments of disconnectedness or anxiety. The warm, woody aroma of Balance, dōTERRA®’s grounding blend, creates a sense of calm and well-being. We perfectly blend spruce, rosewood, frankincense, and blue tansy with fractionated coconut oil to offer an enticing fragrance which promotes tranquility and a sense of balance. For aromatic or topical use. ELEVATION (a joyful blend) – Elevation is the perfect blend for those moments when you need to be revitalized. This exciting blend provides an invigorating combination of CPTG® essential oils that can elevate your mood and increase your energy. Elevation is a blend of lavandin, tangerine, elemi, lemon myrtle, melissa, ylang ylang, osmanthus and sandalwood blended flawlessly for an immediate and dramatic effect. For aromatic or topical use. SERENITY (a calming blend – one of MY favorites!) – Stress is a major contributor to illness and disease, in fact, it is estimated that more than 90% of all visits to health care professionals are related to stress. Serenity is a blend composed of individual oils with known calming properties which create a sense of well-being and relaxation. Lavender, sweet marjoram, roman chamomile, ylang ylang, sandalwood and vanilla bean create a subtle aroma ideal for aromatic diffusion or topical application. Applied to the bottom of the feet at bedtime, dōTERRA®’s Serenity is an excellent way to promote restful sleep. Added to a warm bath Serenity creates the perfect escape with its peaceful, renewing fragrance. For topical or aromatic use.